It is immediately obvious that the Moerlein Lager House wants you to be comfortable and to stay for a while. 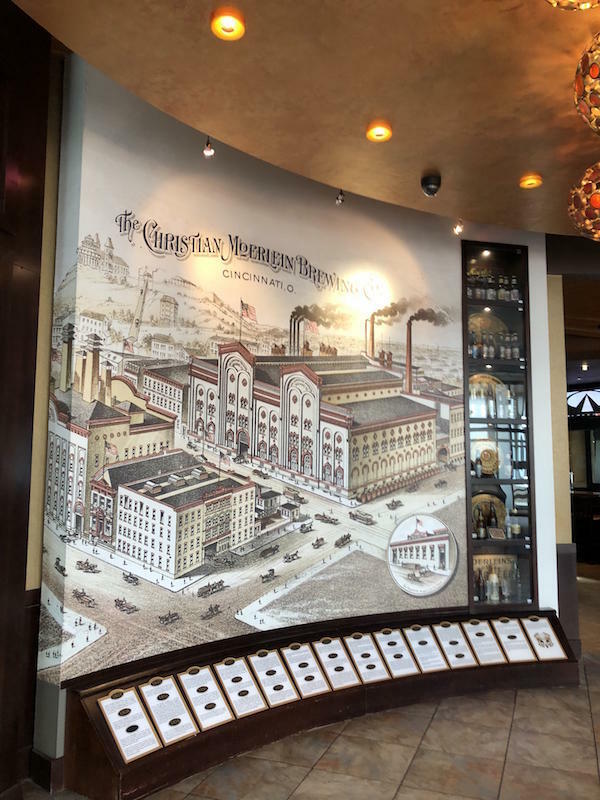 The food and décor celebrate Cincinnati’s long fabled brewing history and both have been created on a first class level to ensure there’s reason to stick around. If you weren’t aware, beer was one of Cincinnati’s leading exports and the breweries themselves were a major employer of Cincinnati, for nearly 100 years leading up to Prohibition. 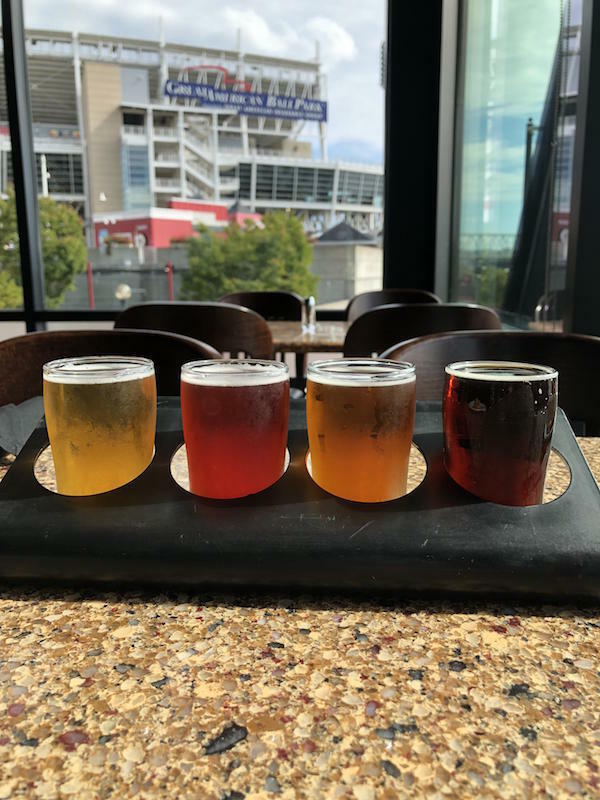 Although Cincinnati had previously been well known as the center of pork production in the U.S., beer eventually took the lead in driving Cincinnati’s economy. By 1890, Cincinnati was the 3rd largest beer producer in the country. Local Beer baron, Greg Hardman, purchased the Christian Moerlein brand in 2004 and has kept a watchful eye on its faithful production ever since. In 2012, Hardman incorporated the same attention to detail he used in his beer production into the Moerlein Lager House. A celebratory mood and a great sense of pride are felt the moment you enter this large venue. The staff is excited to be here and it shows in their demeanor and delivery. They are rightfully proud of the food and drink they’re about to serve you and seem very confident you are going to have a great experience. They are correct! I could ramble for some time about the fabulous setting and it truly is fabulous. 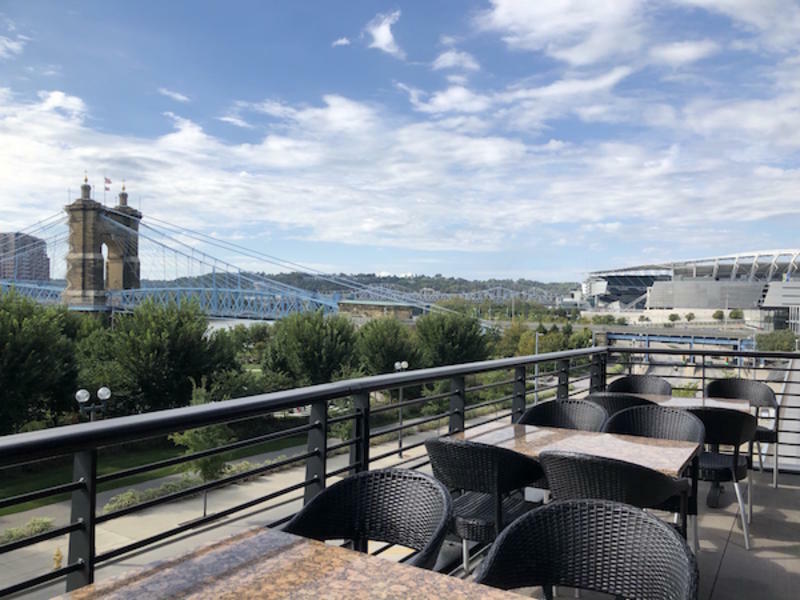 This is the perfect place to stop before or after an event at any of the nearby venues whether it’s your favorite Cincinnati sports team or one of the numerous nationally recognized museums nearby. Fact is, you may have so much fun here that your visit here becomes the main event. On the day of our visit the sun was shining and the river flowing freely. A very relaxing spot. We had eaten here several times but wanted to be sure and broaden our horizons and order dishes we had not yet tried. We were not disappointed! Moerlein Executive Chef Jon Meiner has come up with an incredible menu that highlights traditional ideas with unique adaptations to keep you coming back for more. We started with the Fried Pickles and Anaheim Peppers. What an opener! 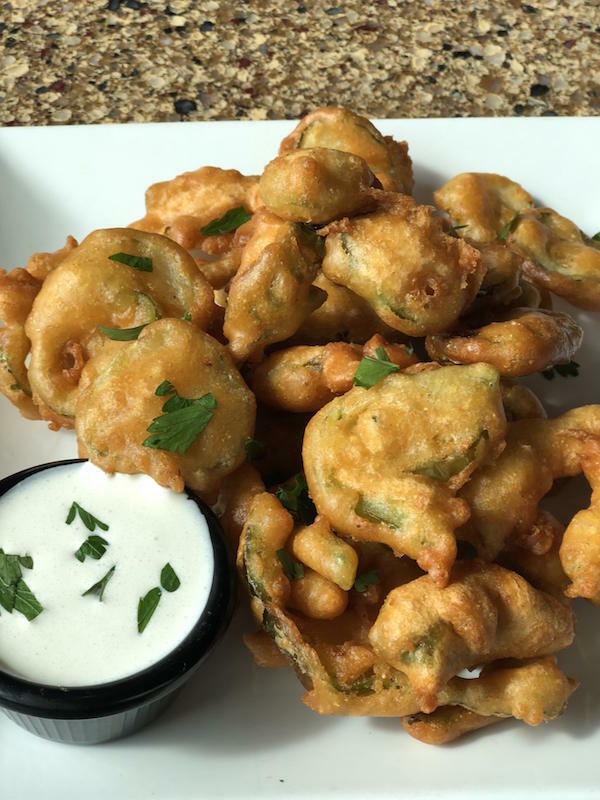 Fried pickles are one of my favorite dishes and I’ve had them in many places. However, the ones at the Moerlein Lager House were out of the park! The pickles and peppers were coated in special batter made from their famous Christian Moerlein beer. That must be the secret. Good to the last bite! The horseradish sauce was just unbelievable. Of course, these were accompanied by a flight of beers that were all exceptional. The flight was an excellent representation of the various flavors and accents presented in the beer here. This particular flight consisted of Golden Helles, Current Trend, OTR English Pale Ale and my favorite, Barbarossa. Each brew had its own personality but I was overall impressed with the quality of flavor across the board. Next up was the Spicy Garlic Shrimp. These were perfectly cooked and came in a sauce of chili garlic butter and a grilled baguette. The shrimp were so good it seemed they jumped into my mouth on their own! The baguette helped ensure none of the remaining sauce went to waste. I’d heard so much about the legendary Moer Burger that I had to give it a try. 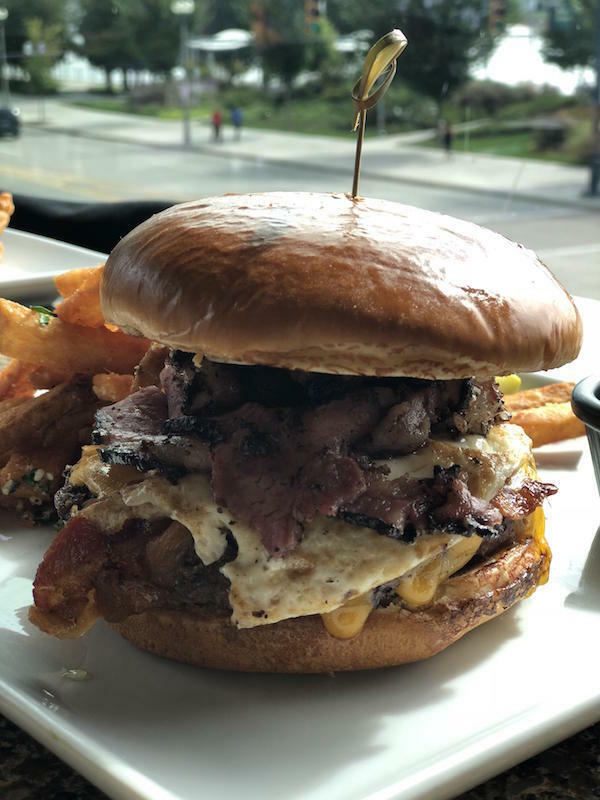 This juicy burger was topped with cheddar, pastrami, applewood bacon, sweet onion relish, black pepper mayo and a fried egg helped bring this mouthful full circle. What a combo. As a bonus, the fries were just right. Crisp and not greasy. As with every other dish we experienced, you just can’t leave any of this behind. It was just too good. We tried another of the chef’s special creations next, the Hot Mett and Ham Torta. This unique combination had just the right amount of hot mett and was a creative and unique group of flavors that included guacamole, mayo, Swiss cheese, pico de gallo all on a nice soft baguette. This was an embellished and improved version of a traditional Cuban sandwich. To finish the meal, we had the Apple Almond Bread Pudding. 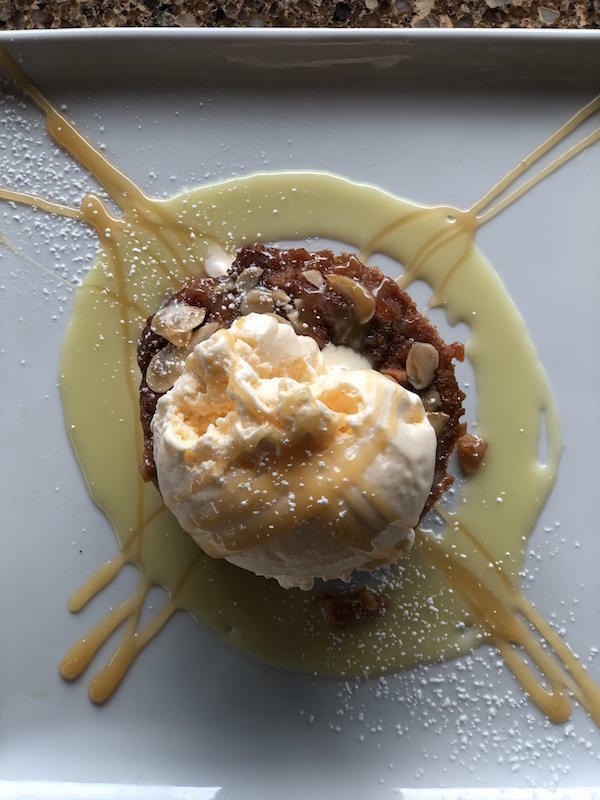 This was a freshly prepared combination of hot and cold as the tasty toffee crusted vanilla ice cream was a perfect compliment to the hot bread pudding. The addition of the white chocolate and caramel sauce was an unexpected bonus. The Moerlein Lager House is a Paradise for Food and Beer Lovers! To accompany all of these great dishes, we had a nice sampling of the beers served here at the Moerlein Lager House. The Beer da Tiger was a double IPA and turned things up a notch when needed. The Barbarossa was my favorite and is both smooth and refreshing. The 7 Hefeweizen was perfectly done and as good as any I’ve tasted. Overall, the Moerlein Lager House excelled in every single category. Every bite of food and every drop of beer were just fabulous. The brew masters and the chef have worked together to deliver a flawless and well rounded dining experience. It was so good you didn’t want it to end. Of course, that just means you’ll be coming back for more as soon as you possibly can! Check out the Moerlein Lager House Menu!